HiAce Goes Out Of The Box. 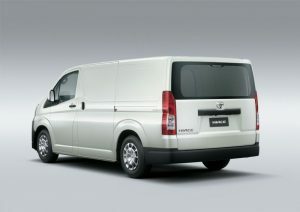 Toyota’s venerable HiAce light commercial van has gone from a smooth, ovoid, mid sized van to a boxy and bigger version. 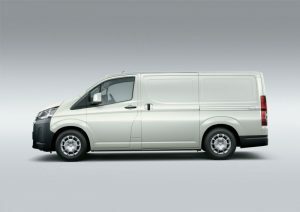 Although not in the same capacity range as a Sprinter from Mercedes-Benz of a Trafic from Renault, its more compact size has allowed thousands of people to become a courier delivery driver, a taxi, or a people mover. Due for a mid 2019 release, the latest version has had one very noticeable design change. Gone is the long standing blunt nose, finally replaced with a semi-bonneted design. This has the end effect of engineers providing a stiffer chassis that offers an improvement in straight line performance and stability. Manoeuvrability from a range of more pliant suspensions is an extra bonus with new MacPherson struts being part of the uprated suspension system. The rear has newly designed leaf springs, with an increase of length of 200 mm adding an extra 30 mm of travel for a more compliant ride. Seating will range from a two seater version on a long wheelbase (LWB) and super long wheel base (SLWB), a five seater LWB van, and a super long wheelbase (SLWB) 12 seater commuter van. Motorvation has changed as well. There will be two new engines – a 2.8-litre four-cylinder turbocharged diesel or a 3.5-litre naturally aspirated petrol poweplant, both available with six-speed manual or automatic transmissions. Confirmation of power, torque, and consumption will be made available closer to the release date. 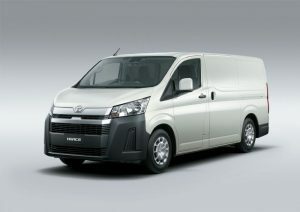 A hallmark of the HiAce has been its cargo carrying ability and has been maintained at a maximum of 6.2 cubic metres for the lLWB wheel base and 9.3 cubic metres for the SLWB thanks to the redesign that offers clever packaging which increases internal width by 215mm and height by 5mm without altering overall exterior width. The SLWB two-seat van is capable of accommodating Australian standard pallets (1165mm x 1165mm) through its wider sliding side doors. Inside will be a range of mounting points to help secure cargo. The expected safety rating is five stars, thanks again to the redesigned chassis, and with up to nine airbags being fitted depending on version. Pre-collision warning with cyclist and pedestrian detection, autonomous emergency braking, and reversing camera are complemented by a digital rear view camera that can be fitted as an option. Extra design features make the new HiAce just that little bit more human friendly too. The doors have a lower edge and sit over a wider step for easier access. The window glass is larger for better vision and a lower beltline means better side vision. 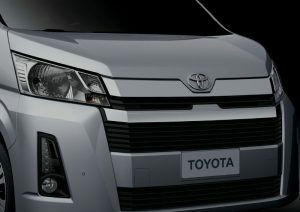 Pricing for the 2019 Toyota HiAce is yet to be confirmed.